I am not embarrassed to admit that I am one of those annoying people who drink hot coffee in the summer. I also enjoy hot soup on occasion – as long as as the air conditioning is blasting. Summer weather is not really my thing, so I pretty much go through the entire summer in denial that it’s even happening. If the humidity is over a certain level (which in Ohio it always is) I just avoid being outside for more than about 10 minutes at a time. I have the pasty white skin to prove it. Even though I enjoy my daily hot coffee year round, I do take advantage of the summer time to add a little variety to my coffee fix. Iced coffee is up there on my list of loves, as is this Coffee Granita. It’s like dessert and a caffeine fix all in one. How awesome is that? This recipe is so incredibly simple, I made it first thing in the morning and even my caffeine deprived brain managed to not mess it up. Simply take your favorite coffee – the stronger the better – sweeten it with some brown sugar and boost the flavor with a bit of citrus zest, dash of Kahlua and pinch of cinnamon. All of this java goodness gets placed into the freezer and fluffed with a fork every half hour or so as the ice starts to form. That is all it takes. I told you, simple. What you are left with is a mountain of pale, fluffy coffee crystals who’s flavor is anything but simple. The intensity of the coffee flavor is just right, as are the notes of citrus, cinnamon and Kahlua that come through. Feel free to doctor up this recipe with your favorite coffee enhancers and make it your own. Coffee is personal like that. 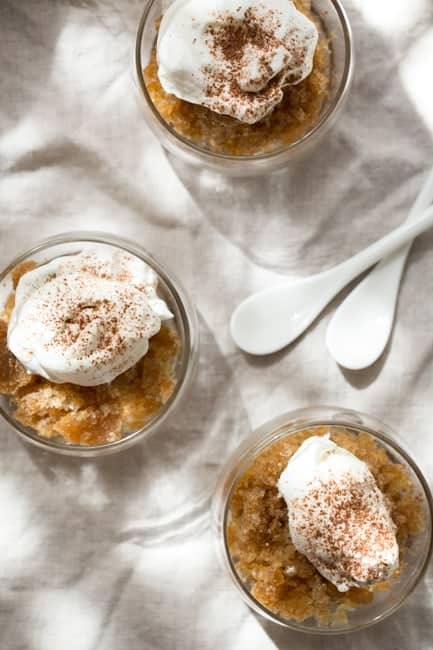 And let me tell you, finding a dish of this icy Coffee Granita in your freezer will certainly turn around any particularly long (or sweaty) summer day. Add all ingredients into an 8 inch square metal baking dish and whisk together until sugar is dissolved. Cover with plastic wrap and place on a level surface in the freezer. After 20 minutes, use a fork to scrap ice crystals off the insides of the dish. Repeat this process every 20 minutes for 2 to 3 hours or until all coffee mixture is frozen into a pile of fluffy, caramel colored ice crystals. Fluff one last time with a fork and allow mixture to sit in freezer for an additional 15 minutes for the final freeze. 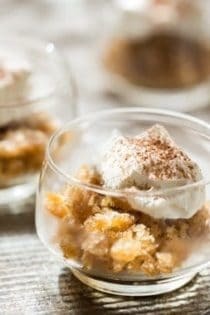 Scoop crystals into glasses or serving dishes and top with slightly sweetened whipped cream (if desired) and a dusting of cocoa powder for garnish. Granita can be made ahead of time and kept covered in the freezer until ready to serve. Mmm what a fabulous way to start the day! I drink hot coffee in the summer too. It’s awesome! Kahlua? In the morning??? I like your style! Might have to add this to my morning routine! I personally love summer and everything that comes with it (yes, including the heat) but my office AC is cranked way up so I always find myself drinking hot coffee in the morning! And I like iced coffee all year round! Which means this treat would work for me anytime; I just love granita and coffee flavored would be perfection. Love thats its got whipped cream on! Yum! 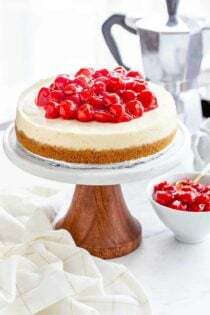 Oooh this looks so delicious! Ohhh heeeeyyyyy, Ill drink a hot drink in a ka-zillion degrees while eating hot soup! Twinsees! Oh now this is such a unique flavored granita. I love this! Genius! Coffee granita, what a great idea! It looks like the perfect way to cool off on a hot summer day. Perfect for a coffee addict. Wow, those sure look good. Thanks for the recipe, I will definitely try it out.